“Silver on the sage, starlit skies above, aspen-covered hills, country that I love,” sing families in an outdoor amphitheater in northern New Mexico. Parents and children of all ages are snuggled together on benches under a dark, starry sky. The families are attending the opening program at Philmont Scout Ranch as part of the Priesthood Leadership Conference on Scouting. 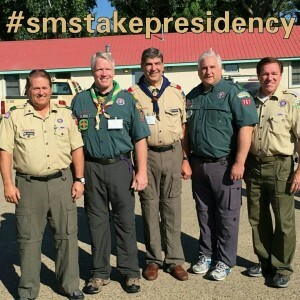 The conference takes place each summer under the direction of the Young Men and Primary general presidencies, with assistance from the LDS-BSA Relationships Office. Two week-long courses are held, and stake leaders from across the United States and Canada, along with their families, are invited to come and learn about Scouting and the Aaronic Priesthood. This summer marks the 52nd year the Church has provided the training course at Philmont, and over 316 Church leaders (with their family members totaling more than 1,100 people) attended. It was the first summer for newly called Young Men general president Brother Stephen W. Owen to preside at the conference.